Some readers have criticized my use of the word “nutjob” to describe Magdi Allam. That is admittedly an imprecise description of a journalist-turned-demagogue whose views are nativist at best and racist at worst. Like Oriana Fallaci before him, Allam has a deep and abiding fear of Muslims in Europe. Unlike Fallaci, Allam was born in Egypt. 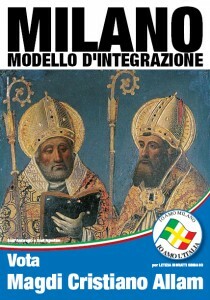 Allam made a reputation writing for the mainstream Italian press in support of multiculturalism, the positive effects of immigration, and against the clash of civilization, but had a rather radical change of heart in late 2002. Since his baptism by none other than the pope himself in 2008, he has acquired a fervid fear of Europe’s Islamizication that now dominates the pieces he writes for Berlusconi-owned il Giornale now. It is a shame that a cosmopolitan writer of such insight now resorts to the kind of ugly race-baiting that garners support from the most virulent and provincial supporters of an ethnically homogenous Italy. As he says in “Let’s Rebel Against Europe,” Allam has given himself the noble struggle of protecting Judeo-Christian values in Italy. That Christian Europe finds itself in an identity crisis thanks to low churchgoing and low birth rates I do not dispute. That the Catholic Church can use its influence for the good – as the Pope did yesterday in Venice, speaking of compassion of refugees and immigrants I do not dispute either. But when Italy’s right to display crucifixes in classrooms was upheld using some supremely contorted legal reasoning, the fact that it was an Italian and a Fin that brought the case to court was overlooked by the Italian press. Equating all Italians with Catholicism and integration with religious indoctrination is regressive identity politics. Allam happily practices this. Allam’s posters offer no proof that he makes a distinction between legal and illegal immigrants. Showing different-looking faces and habits with NEVER AGAIN emblazoned above them feeds but one instinct: fear, a powerful driver in Italian political life. Once sown, what strange fruit does such fear yield? Read about it in the papers, or in Human Rights Watch’s report that I wrote about when it came out: Africans beaten with bars, Indians set on fire while sleeping, Roma driven out by mobs, mafia exploitation of Africans in Rosarno, further ghettoization and political irrelevance. Immigration presents massive problems in Italy that are different to the problems in the US, UK or even France. Italy’s late entry into the colonial game, rapid rise to wealth and a tradition of xenophobia based on local rivalries all present extreme problems for newcomers. As a 2008 Brookings paper pointed out, though, low growth, lower birth rates and the lack of willingness of Italians to do low-skill jobs, however, means that immigrants are not only necessary but the only bright spot in an economy that stagnates year after year. Strife all along Italy’s borders, from the Mahgreb to the ex-Yugoslavia, for the past two decades means they are inevitable. Italy’s immigrants are struggling to find a voice as they come of age, many of them raising children who are passing to adulthood now. But other than a handful of newspapers in the bigger cities and a good website, there is little unity or political voice, and nothing like the Southern Poverty Law Center or Anti-Defamation League in the US or Anti-Racist Action in the UK, in part because immigrants have not ‘made it’ yet. Suspicion of people with different colors and accents runs deep. The opportunistic and the cynical gladly tap these fears for their own narrow self-interest, and I fail to see how monitoring images that appeal to this cynicism is buonismo. A better example of buonismo would be to dismiss criticism of Allam based on his earlier writings in praise of immigration, multiculturalism and cosmopolitanism. It is a shame that Allam followed in the great tradition of Italian politicians and leaders before him in choosing to pursue his own narrow self-interest that bound him to Berlusconi rather than to found what could have been Italy’s first multi-cultural or pro-immigrant party; a sort of anti-Lega proving that immigrants could successfully integrate. But perhaps such cynicism is part of full integration. There are good arguments to be made for preserving Italy’s cultural heritage and for stopping the flow of dangerous, cheap, or illegally made goods. Demagoguery that sustains the politics of fear is not the way to do it. I will give Allam the benefit of the doubt that perhaps the “Department of Identity, Citizenship, Integration and Development Solidarity” that he says he would found might help matters. American citizens do have to submit to a short 10 question test before they can put their hands on the flag and take a short oath. But such ceremonies, like baptisms, are largely symbolic. True integration is cultural and economic, based in tolerance and understanding and not bureaucracy. The test of adherence to a symbolic creed is in the actions it produces. In the case of Magdi, his actions speak far louder than his words or his images. 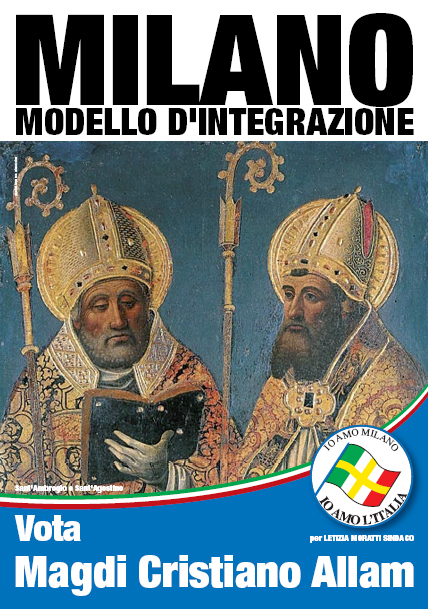 Hat-tip to Eleonora Bianchini of Il Fatto Quotidiano and author of The Book the Northern League Would Never Let You Read for also writing on the folly of Allam’s rigid bids for assimilation via conversion this week. This entry was posted in Bossi, Chinese, gypsies, human rights, il cav, immigration, italy, lega nord, roma, the italian left, the italian right, the right in europe, Via Sarpi and tagged arabs, Chinese, fear, italy, lega nord, magdi allam, racism. Bookmark the permalink.